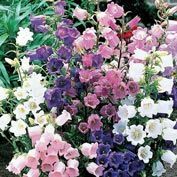 Canterbury Bells | Gurney's Seed & Nursery Co.
Everything about this old-fashioned garden favorite is fabulous! From the stunning shades of soft pink, soothing blue, rich purple or snowy white, to the attractive bell shape of the blooms, charming Canterbury Bells has us enchanted. Showy spikes grow up to 3' tall, and are liberally covered in big clusters of the multicolored flowers. Easy to grow, it blooms from late spring to midsummer in full-sun to partially shaded spots such as the back of a mixed border, cutting beds or as a lovely addition to a free-flowering cottage garden. Canterbury Bells require only well-drained soil to thrive in the landscape. Hardy in Zones 4-9. Depth: 1/8 inch for seeds. 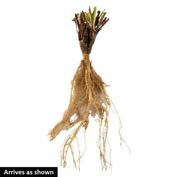 When planting bareroot plants, prepare suitable holes, spread roots and work soil among the roots as you fill in the soil. Water well. Comments: Water deeply twice a week when weather is hot and dry. Remove some flowering stalks as flowers fade to encourage more blooming. Aways leave some flowers to seed as this is a biennial and reseeds itself to return year after year. 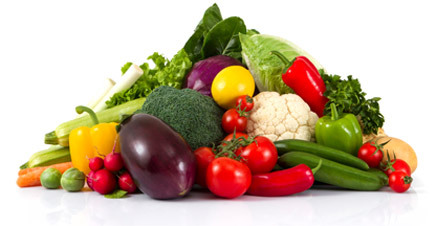 Provides Blooming between the spring and summer flowering plants. Useful as a border or accent plant. Unique cup and saucer shaped blooms. 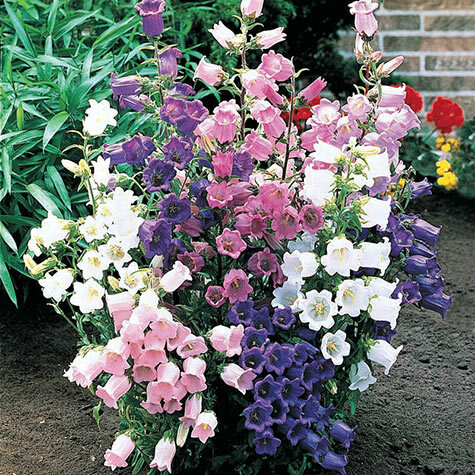 *Also referred to as campanula medium in other offers..* Plant with: other tall perennials;delphiniums, or hollyhocks.